I grew up watching “60 Minutes” Sunday evenings, so like many people, I was saddened to hear of the death of commentator Andy Rooney last month. He was occasionally too curmudgeonly even for me, but he presided over the final minutes of a show that was a fixture in our household. One of my favorite segments aired a few years ago, when Rooney replayed bits from a 1986 CBS News series that previewed what life would be like in 2001. Experts predicted that the Russians would land on Mars, cars will be commanded by operator's voice, Americans would work just 30 hours a week, cows would be the size of elephants, and pigs would be five feet tall. It hasn't quite turned out that way. Cows and pigs are still the size of cows and pigs, and my car doesn't respond to my voice — not even the expletives I shout in traffic. It's important at this time of year to remember how hard it is to predict the future, because soon we'll begin to see articles in media featuring various experts' guesses for what the stock market will do in 2012. As evidence of the value of such forecasts, let's travel back to a Jan. 2, 2002 article in USA Today. The article featured the predictions of eight top Wall Street analysts and where they thought the S&P 500 would be at the end of 2002. The article began by pointing out that not one of the analysts polled a year earlier were right about 2001: Each had predicted a positive year for the S&P 500. Instead, it declined 13%. Did they do a better job in 2002? Nope. The average prediction was for an 11% gain. As you may recall, the S&P 500 declined more than 22% in 2002. More recently, a BusinessWeek article published at the end of 2007 listed the predictions of six strategists of where the Dow would be at the end of 2008. The average guess was 14,925; by Dec. 31, 2008, the Dow had plummeted to 8,776. Some prognosticators expected the Dow to be even higher. Back in March of 2008, Mark Hulbert — who has tracked the performance of hundreds of newsletters since 1980 — highlighted the prediction of Richard Band, whose newsletter's risk-adjusted return was “in the upper echelon of newsletters.” Band claimed that the market was forming “the ‘right shoulder' of a head-and-shoulders bottom,” and the Dow would reach 16,000 by late 2008 or early 2009. Instead, the Dow closed as low as 6,547 in March 2009. Alaska will be part of Russia? Has anyone told Sarah Palin? In September, the Freakonomics team (author Stephen Dubner and economist Steven Levitt) devoted an entire podcast to predictions. They interviewed Phil Tetlock, a research psychologist at the University of Pennsylvania. Tetlock says, “There are a lot of psychologists who believe that there is a hard-wired human need to believe that we live in a fundamentally predictable and controllable universe. There's also a widespread belief among psychologists that people try hard to impose causal order on the world around them, even when those phenomena are random.” This creates a desire — and market — for forecasters. But how good are these soothsayers? Over the past 20 years, Tetlock has tracked approximately 80,000 predictions of 300 political experts. The result: Their predictions are only slightly more accurate than a sample of undergraduate students or random guessing, and slightly worse than “a computer programmed to predict ‘no change in current situation. '” Not very impressive. Okay, so no one knows what the stock market will do next year or even the next few years. There is evidence to suggest that overall market valuation provides a hint as to what to expect for the next seven to 10 years. That's helpful for retirement planning, since we can use that estimate in our financial calculations. But it doesn't help the market timer. Only pay attention to people who have a track record of being right about things that are possible to be right about. 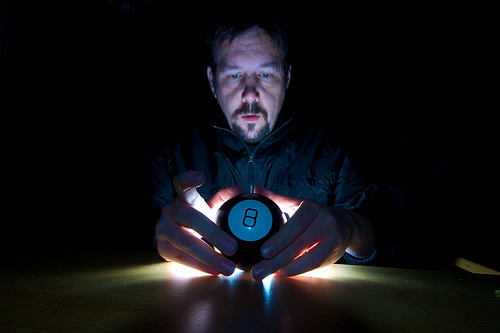 An expert stock picker or fund manager could possibly be skilled… or just lucky. Someone who correctly guesses where the Dow will be a year from now is definitely just lucky. Since the stock market can drop in any given year — despite what the “experts” predict — make sure you keep money you need in the next three to five years out of the market. Be aware of incentives. Is someone making a prediction that leads to buying a certain product or service she or he sells? Is the person dogmatic or ideological? Tetlock's research found that people with pre-set, rigid beliefs had the worst record. Invest at least a portion of your money according to the acknowledgement that you — or the advisers and managers you hire — could be wrong. In other words, stay diversified and invest at least some of your assets in index-based investments. Don't run your financial life in a manner that is dependent on just one outcome or on your life continuing on the same path uninterrupted. Always have a Plan B. There are 25 reader responses to "The Follies of Fortune Telling". I think this has gotten worse and worse as technology has gotten faster and more widespread. Now there is a desire for knowledge instantly at your fingertips, constant updates and tracking, and an often insane reliance on minutia all fueled by being constantly wired in and buffeted by the information flow. Right or wrong those who scream the loudest in the din catch your attention. It’s hard to sift through the noise to see what’s important. It drives me crazy when a company makes an announcement and their stocks rise or fall dramatically based on a single story. Unfortunately, financial news is like any other kind of news — it drives revenue for the publisher. The really stupid thing is that most industry “insiders” (read: involved enough to know the players but not true insider trading) usually have a sense long before official announcements come down the pike, and make their trades well before the day of the announcements. A really good example of this is Apple announcing new products. By the time Apple gives a keynote address, the rumor mill generally has about 75-90% of what is going to be announced nailed down, and serious investors have already positioned themselves accordingly. If you wait until the day of the announcement to buy or sell, you’re pretty much late to the party. The problem with most economic forecasting models is that they start with numbers, whereas the actual economy is often more driven by emotions. As someone not trained in business models, but trained in observation of human reactions, I find that I usually have a better sense of what’s likely to happen than most formal “predictions”, simply bc I’m pretty good at predicting what the public reaction will be. Of course, I also realize that since so much is based on intangibles that can be hard to foresee, I would not try to invest serious money on even my predictions. I mean, who started out 2011 thinking that Japan would be struck by a devastating earthquake/tsunami which would essentially paralyze certain industries? Wonderful article. I am constantly amazed at the number of people that love to guess where the market is headed AND make big financial bets on the direction. I’m nearly as amazed at the number of people who refuse to play any defense with their portfolio at all. Your piece is definitely a call for defense. Not because things are bad, but simply because we never know what’s going to happen next. But the market returns 8% after adjusting for inflation every year! I used that number in all my examples! How else can I tell people that buying an iPhone coats half a million dollars? Now you’re saying that I can’t just assume 8%? How will I know when I’ll be able to tell people in the Internet that I’m “financially independent” then? I find it really hard to figure out when I’ll reach “financial independence” because right now the numbers are so gloomy. It doesn’t help to tell me that the market yields 8% per year when my early years aren’t looking so hot. Is the market supposed to drastically jump to compensate? No that means everything is on Sale! Hurry, buy now! These are only the predictors on mainstream media. There are plenty of fringe financial gurus who predicted both the gradual market decline through the first few years of the century and culminated with predicting a crash in 2008-9; self same guru’s predicted the rising price of gold and silver etc etc…depends on whom you listen. But people do tend to want to believe good news over bad. I was an early reader of Motley and the Daily Reckoning…I remember well the musings of what would happen in an America that thought it “got paid to think”. I enjoy predictions when people are selling books or advertising, or are just looking for an excuse to not take control of their life if “A, B, and C are going to happen and screw us all, so I’m going to buy a new TV before the financial apocalypse”. Also, conspiracy nuts love predictions as evidence that they are “right”. Again, motivation is the nugget to dig down to. And tying this again to conspiracy nuts, the world is far more boring than speculators and entertainment fiction. It’s pretty rare that a plane crashes into a building, and just because the outlier occurred doesn’t mean all the causes have to be some crazy black ops secret new world order plan. Sometimes, crazy people just do crazy things. And on many financial advice sites, I LOVE when an author is providing good solid advice and uses historical market returns, only to have someone toss ALL the advice out the window by saying “the market will never return that” or “the past [insert time window of desired counterpoint] was never close to that!” and instead of reading an article about time savings of money and compounding interest, or reducing highest interest debt first, they take no responsibility and just throw money at the next big fad (gold, real estate, “plastics”). Predictions are not canon, doctrine, or absolute. Logic shows that that most frequently occuring results are the most expected results. Misapplying data from one set to another (such as 60 years of the stock market, inflation or oil prices to a 12 month window) is foolhardy. Predictions about 5 foot tall bigs, cloning mammoths, and Russians on the moon are about hope and motivation, not fear. We’ve been dreaming of flying cars and farming in the desert for decades. When we stop dreaming, that’s when we’ve truly lost. I used to work on Wall Street and interact with the economics staff of our brokerage. They were very proud of their 40-variable model that had been backward tested and ‘proven’ accurate. Mathematically, if you have 40 variables and are allowed to give them cyclical direction (eg you assume that they will go up or down in the future, based on a given usual length of cycle in the past) you can match *anything* with a backtest. I don’t remember the exact math, but functionally it only takes about 4 variables to build a ‘really good model’ if you’re allowed to use sin and cosine waves as the shape of your cycles. And they could be any 4 variables-like all the folks who try to predict the stock market based on which league wins the World Series! The point is that the process of running the backtest gives you the constant (multiplier) values, you don’t base those on rational thought. And with enough variables, you will get an “accurate” model – but accurate only for the past. Good luck on the future! So anytime someone cites their ‘multivariant model’, feel free to scoff! Especially if they brag about how they’re always reviewing the model to ‘insure’ its accuracy. That stuff from the Russian guy predicting the USA would split up into 6 parts is hilarious. Its clear he doesn’t know anything about Texas. Keep an eye out for “The Economists” oops we were wrong section in their Year in review magazine issue. Got to respect people who are willing to ‘fess up when they get their predictions wrong. Yeah I like this, prediction isn’t a physical thing in a sense. They can call themselves experts and praise that they hold all the answers, but in the end it is only us that can really determine our own fates. The paths that we go down whether experiencing successes or failures are 99% determined by the individual, and them alone. So, how big were elephants supposed to get? It’s amazing how incorrect a lot of predictions are. I agree that we should take predictions with a grain of salt and listen to those who are often correct. Great piece and perfect timing. The talking heads on TV and their obnoxious cousins of talk radio really irk me when it comes to the extremes of predictions. Glad to hear a much more reasonable take on things. The ‘experts’ from 1986 were a little off on the timing, but thanks to blue-tooth and other technologies you have been able to control your car (at least parts of it) with your voice since about 2004. These systems seem to be improved and expanded each year. Yep, we will soon be flying our boy Elroy to school every morning. This is basically the point Nasim Taleb makes in his book “Black Swan”: No one can predict the future. It’s a fascinating read how he took that unpredictability into an investment strategy. For those of you who is going to say “but look at XYZ!”… the problem with predictions is that failures are never publicized, yet when it’s successful, these predictors trumpet it – thus creating a bias. Imagine flipping a coin and being able to hide 50% of your flips… suddenly you’re a soothsayer. The Black Swan is great, but too many laypeople (and finance professionals) took it as a reason to believe more in the outlier than in the fat meaty middle of the bell curve. If everyone bets on the underdog winning the superbowl, Vegas adjusts the odds. Same thing with Wall Street if everyone is going nuts. I’m not going to pontificate on my own thoughts on gold, but ever notice that when something becomes a super hot “sure thing”, there’s a correction bubble at some point? If everyone is betting A, you go B to be a Black Swan. The more people start betting on B, it’s no longer a Black Swan. Great post! I’ve always been against long-term planning and long-term forecasting EXACTLY BECAUSE things are so complex no one can say for sure what’s going to happen. Just look at how your average day goes. Unexpected stuff happens all the time: your bus is late, there’s an emergency at your kid’s school, or maybe you’re stuck in an elevator and that somehow changes your whole day. If you can’t predict how tomorrow goes, what can we say about a year or years from now?